Lead safe work practices are a critical piece of maintaining a healthy home. Homeowners and contractors alike must take responsibility for minimizing the risk of lead poisoning to people who live in and work on the home. 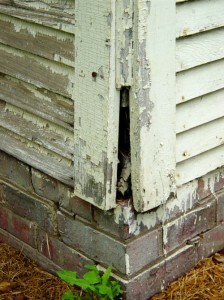 One indicator of a potential lead paint hazard is the visual appearance of scaling or “alligatoring”. Iowa ranks 5th in the nation on percentage of homes constructed prior to 1950. Twenty-seven percent of the homes in Polk County were built prior to 1950, and of those, virtually of them will contain lead based paint. Adults can become lead poisoned. Adults can carry lead dust home on their clothes after working on buildings with lead based paint, leading to high blood levels in their family members. Among the 1999 birth cohort, 6.8% of Iowa children tested had blood levels of greater than 10ul/dL, the national cutoff for “Elevated Blood Level”. Lead poisoning is not necessarily acute, but can be a chronic disease with few recognizable symptoms. Adult symptoms include headaches, poor appetite, sleeplessness, nausea, bowel irritation, and tremors. Lead can be found in many circumstances including interior paint, exterior paint, varnish, pipes, toys, lead-glazed pottery, jewelry, hobbies (fishing sinkers, casting, stained glass), and some folk remedies. There are practical steps contractors and homeowners can take to minimize exposure to lead based paint chips and dust. This online “mini-book” will discuss the currently accepted lead-safe work practices, but will not serve as a substitute for attending a class taught by a qualified professional. There are federal and state notification requirements that contractors MUST follow when they are working on pre-1978 housing. If you don’t follow these requirements, you risk fines. In the absence of a lead risk assessment by a qualified professional, you should assume that ALL paint in pre-1978 homes is lead based. Not all store-bought chemical test kits are not considered reliable by the EPA or HUD, and as of February, 2009, none are considered reliable for testing paint on plaster and drywall. Work smart. Work wet. Work clean. Plan for containment, clean-up, and lead-safe work procedures. Minimize dust during demolition and construction by using misters to keep the work area wet. Provide proper debris collection materials (plastic sheeting, etc), clean up regularly to prevent contamination of other areas, and use the proper cleaning tools and procedures. Following lead-safe work practices can effectively mitigate the danger from construction activities in contaminated homes.